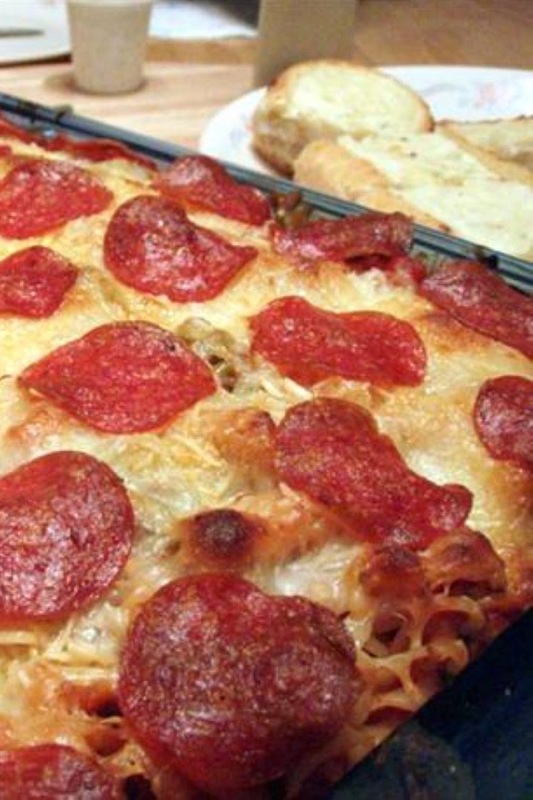 This is similar to many Baked Pasta dishes but with the distinct flavors of pizza. I created this recipe yesterday and took it to a dinner party as the main dish. It was a big hit and every woman there asked for the recipe. Cook pasta in boiling water until al denté. Cook sausage, garlic powder and oregano with onions until the juices run clear. In a lightly greased 9x13x3 inch pan, pour a small amount of sauce to lightly coat bottom. Layer ingredients in the order listed below. 1st layer-1/3 of the pasta, 1/3 remaining sauce, 1 bag of mozzarella cheese, 2 Tablespoons parmesan cheese, sausage and onions. 2nd layer-1/2 of the remaining pasta, 1/2 remaining sauce, 1 bag of mozzarella cheese, 2 Tablespoons parmesan cheese, ham. 3rd layer-all remaining pasta, all remaining sauce, 1 bag of mozzarella cheese, 2 Tablespoons parmesan cheese,all the pepperoni(completely covering the entire top with pepperoni). Bake at 375°F for 40 minutes.